The Mandala Design we are following has a pond featured in the centre of each mandala. The pond is a critical part of the natural pest control system of our garden by enabling a better balance of the predators versus garden pests. We’ve installed a natural pond, without much filtration or attention needed. The garden pests are controlled in a natural way using larger predators who can live in plentiful numbers, in and around the pond, e.g. frogs, lizards and spiders, all we do is maintain an environment to nurture the sustainability of the pest control system. A healthy natural pond with plenty of hidy holes in the rocks. Construction seen here . . . the only way to dig a hole is with one of these. Introducing “Bill the Excavator” (BillEx) Our newest edition to the workforce, demonstrates Pond Building without the sweat. Started with a basic hole the desired size and depth of about 1,500mm diameter by 450mm deep. Then purchased a rubber liner of the correct size to accommodate our dimensions. Smoothed out the surface of the hole with care, removing all sharp stones or twigs, and then laid the liner straight in/across. Spread over the hole, and held in place around the perimeter with nice looking rocks, just add water, it all stretches, and hey presto! 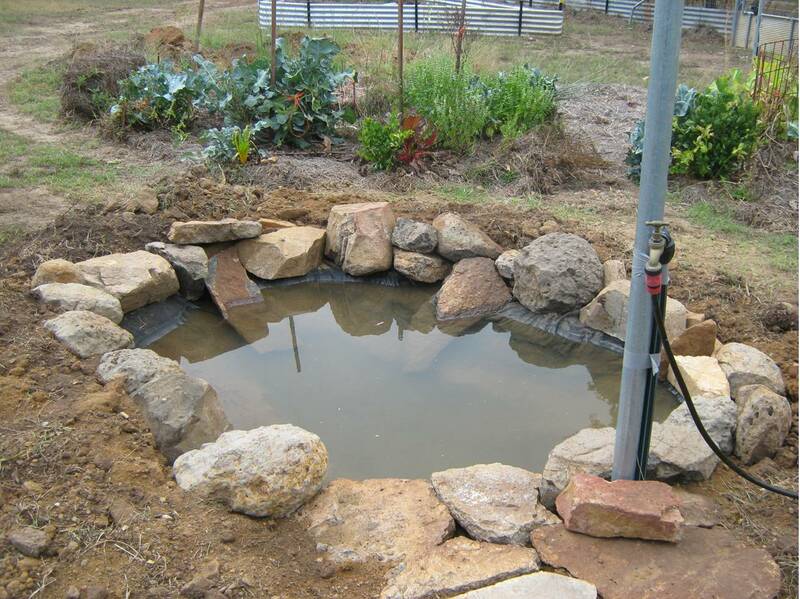 The result is a great looking pond, shown below ready for planting of water plants and herbs in the garden beds surrounding the rocky border. We will never walk in this pond as this will definitely cause a puncture in the liner, but the water’s own weight is not enough to cause a puncture. Better to pre-line the bottom of pond hole with sand, and/or old carpet, or similar sheeting to soften the inside of the hole. As we are not going to step in the pond and ours was soft dry powdery clay, we didn’t bother softening the hole with other layers. Hope it’s OK, guess we’ll see what happens. Categories: Building & Planning | Permalink.